Click here to read more from Mooney on the science of why people don’t believe in science.So when Schafly realized that Wikipedia was using BCE (“Before Common Era”) rather than BC (“Before Christ”) to date historical events, he’d had enough. He decided to create his own contrary fact repository, declaring, “It’s impossible for an encyclopedia to be neutral.” Conservapedia definitely isn’t neutral about science. Its 37,000 plus pages of content include items attacking evolution and global warming, wrongly claiming (contrary to psychological consensus) that homosexuality is a choice and tied to mental disorders, and incorrectly asserting (contrary to medical consensus) that abortion causes breast cancer. The whopper, though, has to be Conservapedia‘s nearly 6,000 word, equation-filled entry on the theory of relativity. It’s accompanied by a long webpage of “counterexamples” to Einstein’s great scientific edifice, which merges insights like E=mc2 (part of the special theory of relativity) with his later account of gravitation (the general theory of relativity). If you are an American liberal or progressive and you just read the passage above, you are probably about to split your sides—or punch a wall. Sure enough, once liberal and science-focused bloggers caught wind of Conservapedia‘s anti-Einstein sallies, Schlafly was quickly called a “crackpot,” “crazy,” “dishonest,” and so on. It’s not that liberals are never wrong or biased. Nevertheless, politicized wrongness today is clustered among Republicans, conservatives, and especially Tea Partiers. You might be thinking that Conservapedia‘s unabashed denial of relativity is an extreme case, located in the same circle of intellectual hell as claims that HIV doesn’t cause AIDS and 9-11 was an inside job. If so, I want to ask you to think again. Structurally, the denial of something so irrefutable, the elaborate rationalization of that denial, and above all the refusal to consider the overwhelming body of counterevidence and modify one’s view, is something we find all around us today. We’ve been trained to equivocate, to not to see this trend toward anti-factualism for what it is—sweeping, systemic. This is particularly true of reporters. The Iraq War. The mid-2000s saw the mass dissemination of a number of falsehoods about the war in Iraq, including claims that weapons of mass destruction were found after the US invasion and that Iraq and Al Qaeda were proven collaborators. And political conservatives were much more likely than liberals to believe these falsehoods. Studies have shown as much of Fox News viewers, and also of so-called authoritarians, an increasingly significant part of the conservative base (about whom more soon). In one study, 37 percent of authoritarians (but 15 percent of non-authoritarians) believed WMD had been found in Iraq, and 55 percent of authoritarians (but 19 percent of non-authoritarians) believed that Saddam Hussein had been directly involved in the 9-11 attacks. Perhaps most alarming of all, in mid-2011 conservatives advanced the dangerous idea that the federal government could simply “prioritize payments” if Congress failed to raise the debt ceiling—risking economic calamity. Economics. Many conservatives hold the clearly incorrect view—explicitly espoused by former President George W. Bush—that tax cuts increase government revenue. They also think President Obama raised their income taxes, that he’s responsible for current government budget deficits, and that his flagship economic stimulus bill didn’t create many jobs or even caused job losses (and that most economists concur with this assessment). Perhaps most alarming of all, in mid-2011 conservatives advanced the dangerous idea that the federal government could simply “prioritize payments” if Congress failed to raise the debt ceiling. None of this is true, and the last belief, in particular, risked economic calamity. American History. Many conservatives—especially on the Christian Right—believe the United States was founded as a “Christian nation.” They consider the separation of church and state a “myth,” not at all assured by the First Amendment. And they twist history in myriad other ways, large and small, including Michele Bachmann’s claim that the Founding Fathers “worked tirelessly” to put an end to slavery. Science. In a nationally representative survey—only 18 percent of Republicans and Tea Party members accepted the scientific consensus that global warming is caused by humans, and only 45 and 43 percent (respectively) accepted human evolution. In other words, political conservatives have placed themselves in direct conflict with modern scientific knowledge, which shows beyond serious question that global warming is real and caused by humans, and evolution is real and the cause of humans. If you don’t accept either claim, you cannot possibly understand the world or our place in it. But why? Why are today’s liberals usually right, and today’s conservatives usually wrong? 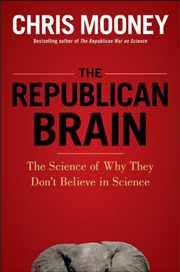 I devoted a book to trying to understand the science behind the political brain—and though I first wrote about some of my findings in Mother Jones let me touch on a few of its findings here. At least since the time of Ronald Reagan, but arcing back further, the modern American conservative movement has taken control of the Republican Party and aligned it with a key set of interest groups who have had bones to pick with various aspects of scientific reality—most notably, corporate anti-regulatory interests and religious conservatives. And so these interests fought back against the relevant facts—and Republican leaders, dependent on their votes, joined them, making science denial an increasingly important part of the conservative and Republican political identity….Meanwhile, party allegiances created a strange bedfellows effect. The enemy of one’s friend was also an enemy, so we saw conservative Christians denying climate science, and pharmaceutical companies donating heaps of money to a party whose Christian base regularly attacks biomedical research. Despite these contradictions, economic and social conservatives profited enough from their allegiance that it was in the interests of both to hold it together. In such an account, the problem of right-wing science denial is ascribed to political opportunism—rooted in the desire to appease either religious impulses or corporate profit motives. But is this the right answer? It isn’t wrong, exactly. There’s much truth to it. Yet it completely ignores what we now know about the psychology of our politics. The environmental account ascribes Republican science denial (and for other forms of denial, the story would be similar) to the particular exigencies and alignments of American political history. That’s what the party did because it had to, to get ahead. And today, goes the thinking, this leaves us with a vast gulf between Democrats and Republicans in their acceptance of modern climate science and many other scientific conclusions, with conservatives increasingly distrustful of science, and with scientists and the highly educated moving steadily to the left. Right-wing science denial is ascribed to political opportunism—the desire to appease either religious impulses or corporate profit motives. There’s much truth to it. Yet it completely ignores what we now know about the psychology of our politics. There’s just one problem: This account ignores the possibility that there might be real differences between liberals and conservatives that influence how they respond to scientific or factual information. It assumes we’re all blank slates—that we all want the same basic things—and then we respond to political forces not unlike air molecules inside a balloon. We get knocked this way and that, sure. And we start out in different places, thus ensuring different trajectories. But at the end of the day, we’re all just air molecules. But what if we’re not all the same kind of molecule? What if we respond to political or factual collisions in different ways, with different spins or velocities? Today there’s considerable scientific evidence suggesting that this is the case. For instance, the historic political awakening of what we now call the Religious Right was nothing if not a defense of cultural traditionalism—which had been threatened by the 1960s counterculture, Roe v. Wade, and continued inroads by feminists, gay rights activists, and many others—and a more hierarchical social structure. It was a classic counter-reaction to too much change, too much pushing of equality, and too many attacks on traditional values—all occurring too fast. And it mobilized a strong strand of right-wing authoritarianism in US politics—one that had either been dormant previously, or at least more evenly distributed across the parties. The rise of the Religious Right was thus the epitome of conservatism on a psychological level—clutching for something certain in a changing world; wanting to preserve one’s own ways in uncertain times, and one’s own group in the face of difference—and can’t be fully understood without putting this variable into play. 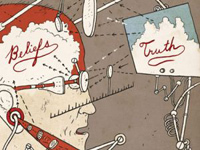 As I began to investigate the underlying causes for the conservative denial of reality that we see all around us, I found it impossible to ignore a mounting body of evidence—from political science, social psychology, evolutionary psychology, cognitive neuroscience, and genetics—that points to a key conclusion. Political conservatives seem to be very different from political liberals at the level of psychology and personality. And inevitably, this influences the way the two groups argue and process information. Nevertheless, some of the differences between liberals and conservatives have clear implications for how they respond to evidence in political debates. Take, for instance, their divergence on a core personality measure called Openness to Experience (and the suite of characteristics that go along with it). The evidence here is quite strong: overall, liberals tend to be more open, flexible, curious and nuanced—and conservatives tend to be more closed, fixed and certain in their views. Scientists are already showing that average “liberal” and “conservative” brains differ in suggestive ways. What’s more, since Openness is a core aspect of personality, examining this difference points us toward the study of the political brain. The field is very young, but scientists are already showing that average “liberal” and “conservative” brains differ in suggestive ways. These differences may be related to a large and still unidentified number of “political” genes—although to be sure, genes are only one influence out of many upon our political views. But they appear to be an underrated one. What all of this means is that our inability to agree on the facts can no longer be explained solely at the surface of our politics. It has to be traced, as well, to deeper psychological and cognitive factors. And such an approach won’t merely cast light on why we see so much “truthiness” today, so many postmodern fights between the left and the right over reality. Phenomena ranging from conservative brinksmanship over raising the debt ceiling to the old “What’s the Matter with Kansas?” problem—why do poor conservatives vote against their economic interests?— make vastly more sense when viewed through the lens of political psychology. Before going any further, I want to emphasize that this argument is not a form of what is often called reductionism. Just because psychology seems relevant to explaining why the left and the right have diverged over reality doesn’t mean that nothing else is, or that I am reducing conservatives to just their psychology (or reducing psychology to cognitive neuroscience, or cognitive neuroscience to genes, and so on). “We can never give a complete explanation of anything interesting about human beings in psychology,” explains the University of Cambridge psychologist Fraser Watts. But that doesn’t mean there’s nothing to be learned from the endeavor. We don’t understand everything there is to know yet about the underlying reasons why conservatives and liberals are different. We don’t know how all the puzzle pieces—cognitive styles, personality traits, psychological needs, moral intuitions, brain structures, and genes—fit together. And we know that the environment (or nurture) is at least as important as the genes (or nature). This means that what I’m saying applies at the level of large groups, but may founder in case of any particular individual. Still, we know enough to begin pooling together all the scientific evidence. And when you do—even if you provide all the caveats—there’s a lot of consistency. And it all makes a lot of sense. Conservatism, after all, means nothing if not supporting political and social stability and resisting change. I’m merely tracing some of the appeal of this philosophy to psychology, and then discussing what this means for how we debate what is “true” in contested areas. But what about liberals? Aren’t we wrong too, and dogmatic too? The typical waffling liberal answer is, “er . . . sort of.” Liberals aren’t always right,but that’s not the central problem. Our particular dysfunction is, typically, more complex and even paradoxical. We often act as though right-wing misinformation’s defeat is nigh, if we could only make people wiser and get them the medicine that is correct information. In this, we both underestimate conservatives, and we fail to understand them. To begin to remedy that defect, let’s go back to the Conservapedia-relativity dustup, and make an observation that liberals and physicists did not always credit. Whatever else Andrew Schlafly might be—and no matter how hard it is to understand how someone could devote himself to an enterprise like Conservapedia—the man is not stupid. Quite the contrary. He’s a Harvard law graduate. He has an engineering degree from Princeton, and used to work both for Intel and for Bell Labs. His relativity entry is filled with equations that I myself can neither write nor solve. He hails from a highly intellectual right-wing family—his mother, Phyllis, is also Harvard educated and, according to her biographer, excelled in school at a time when women too rarely had the opportunity to compete with men at that level. Mother and son thus draw a neat, half-century connection between the birth of modern American conservatism on the one hand, and the insistence that conservatives have their own “facts,” better than liberal facts thank you very much, on the other. So it is not that Schlafly, or other conservatives as sophisticated as he, can’t make an argument. Rather, the problem is that when Schlafly makes an argument, it’s hard to believe it has anything to do with real intellectual give and take. He’s not arguing out of an openness to changing his mind. He’s arguing to reaffirm what he already thinks (his “faith”), to defend the authorities he trusts, and to bolster the beliefs of his compatriots, his tribe, his team. Liberals (and scientists) have too often tried to dodge the mounting evidence that this is how people work. Perhaps because it leads to a place that terrifies them: an anti-Enlightenment world in which evidence and argument don’t work to change people’s minds. But that response, too, is a form of denial—liberal denial, a doctrine whose chief delusion is not so much the failure to accept facts, but rather, the failure to understand conservatives. And that denial can’t continue. Because as President Obama’s first term has shown—from the healthcare battle to the debt ceiling crisis—ignoring the psychology of the right has not only left liberals frustrated and angry, but has left the country in a considerably worse state than that.